Is artificial intelligence (AI) a boon or bane for humanity? Technologists have been grappling with this question for years, and invariably, the conversation returns to fear that these changes will displace millions of workers, lead to widespread hardship and throw society into economic crisis. Our founder and CEO Nathan Myhrvold recently delivered the World Traders 2018 Tacitus Lecture to discuss this fear, which he calls the “innovation menace.” In his lecture, he recounts how history has illustrated that the “doom and gloom” conversation around new technologies is, and always has been, wrong—and why we needn't fear that progress in AI will outstrip society's ability to ensure that the technology improves our lives. View the video below to watch Nathan deliver the London World Traders Guild annual Tacitus Lecture, in which distinguished speakers deliver remarks on a concern affecting world trade. 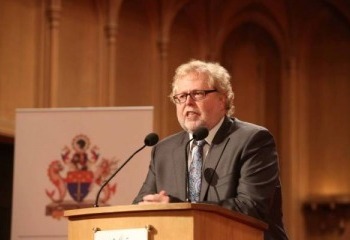 Nathan delivers his Tacitus Lecture at the City of London's Guildhall on February 22, 2018. Photographs copyright Jake Sugden.